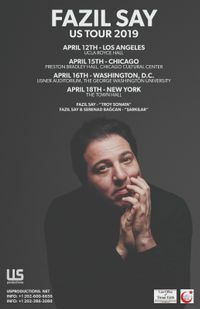 Fazil Say is a Turkish piano virtuoso who began as a child prodigy and has since played around the world, having been honored by leading classical and contemporary music awards internationally. The performance will feature his Troy Sonata in the first act, after which vocalist Serenad Bagcan will join him to present extraordinary examples from Turkish classical and literature fusion songs from the Ilk Sarkilar album. "He is not merely a pianist of genius; he will undoubtedly be one of the great artists of the twenty-first century." (Le Figaro, Paris). Tickets are $50-$100. Information and tickets at https://www.eventbrite.com/e/fazil-say-in-chicago-il-tickets-59207769031 Disseminated by Mercury Public Affairs, a registered foreign agent, on behalf of the Embassy of Turkey. More information is on file with the Dept. of Justice, Washington, DC.